The ultimate goal of any marketing campaign is to generate leads that will eventually lead to a sale. We all know that all too often generating leads is a difficult task. Here are 10 ideas to inject new life into your lead gen efforts. Customized landing pages are crucial to lead generation. What you include on them is equally important. 65 percent of us are visual learners, according to the Social Science Research Network. Why not take advantage of this fact by including visual elements on your landing pages. Include things like videos and infographics that communicate the message visually. When conducting an e-mail marketing campaign, spam is always at top of mind for most marketers. But, whatever you do don’t mention the word “spam” in your e-mail. Doing so can reduce your conversions by a full 18%, according to a case study by Video Website Optimizer. Make sure your e-mails have a clear call to action (CTA). Your CTA should stand out in your e-mail. If it’s not the first thing you see when you open your e-mail, make changes so it is. Your prospects will love connecting with you through videos. Your videos should convey useful information in a friendly format – like you’re sitting down with your prospect and chatting. It’s smart to include a verbal CTA. Make your blog posts, e-books, white papers, etc., downloadable in exchange for an e-mail address. This enables you to create a list of interested leads you can begin to nurture. If you have an about page on your website, your prospects are going there to learn more about your company. This is an important stop on your prospects’ journey. It’s wise to include a compelling CTA on this page as well. If you’ve ever used SlideShare to post a presentation or document, then you know how convenient it is. But, it’s also a good way to get leads. Their Pro Plan enables you to collect leads directly from their platform. 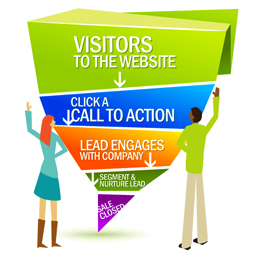 You can send these leads to your landing page. It’s worth checking this option out. LinkedIn offers a publishing platform that enables you to create content and reach a broad audience. Make sure your blogs are engaging and helpful and have an offer. A great way to emerge as a leader in your vertical is to be a speaker at an event. This is the fastest way to lend credibility to you and your brand. It also opens doors for new opportunities, connections, and leads. Seek out other companies that need what you provide and approach them to form an alliance. Be willing to give so you can get. Have a plan beforehand of how you’d like the partnership to develop but be willing to bend to make things happen. By following these 10 tips, you create a sales funnel that is actively helping you generate leads and nurture your prospects. This will lead to more sales.